This is the largest and most frequent wreck off the north east coast and made the national news and regional news for many days. The vessel suffered a large fire in its engine room resulting in a lost of power. The photograph below shows the ship during one its routine voyages. **Ex Nerlandia 87, Ex Jolly Oro 86, Ex Nerlandia 80, Ex Tor Norlandia 80. Built In 1962 By Leurssen Werft, Bremen. Owned At Time Of Loss By Palleskip, Haugesund, Norway. 5 Cylinder Oil Engine, Single Shaft. Machinery By Buckau Wolf, Keil. 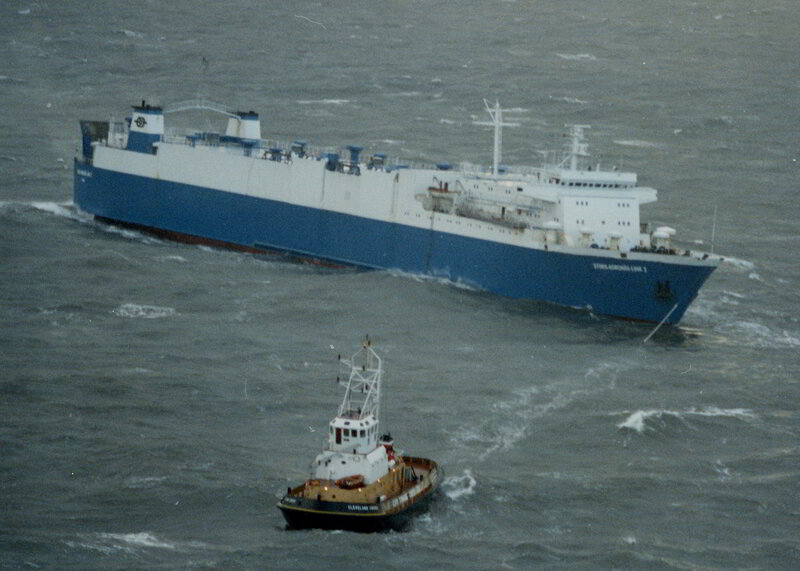 The vessel was taken in tow and anchored off Redcar on the 5th November 1991, a difficult task given the fire and inclement weather at the time. Despite best efforts the fire continued for the next 5 days. The ship finally sank after a huge explosion which was heard for miles. The ship was carrying large paper rolls amongst its cargo, some of which were seen adrift. Following its loss the wreck site was declared off limits as it stood quite proud of the sea bed and was initially buoyed as a danger to shipping. I got the chance to dive the wreck quite soon after its loss and found it to be very dark. Given the type of vessel we didn't expect to see rows of shiny brass portholes, but nonetheless its size was overbearing. It has been wire swept to reduce its height and the sea has already began to take its toll on the external hull, it is not one of the most glamorous dives but still 'one for the books'. It is in an area known for its strong tides and requires slack water, some diving experience and powerful lanterns. Click the images to return to the Wreck Database page. **HH242/351/01 11.11.91 SANK IN 543718N, 005339W. N CARD BUOY, VQ, RACON 'D', LAID 030 DEG (T), 600MTRS FROM WK. (OCC TH, HARWICH, 10.11.91). **HH242/351/01 12.11.91 S CARD BUOY, VQ(6)+LFL 10S, LAID 210 DEG (T), 400MTRS FROM WK WHICH IS CONFIRMED IN 543730N, 005321W. (OCC, TH HARWICH & TYNE-TEES MRSC, 11.11.91). INS AS DW WITH N & S CARD BUOYS. - NM 3305/91. **12.11.91 LIES UPSIDE DOWN WITH BOW POINTING TOWARDS THE BEACH. (LL 11.11.91). TH NM 67/91 REFERS. **HH242/351/01 2.3.92 EXAM 'D 7.2.92 IN 543735.5N, 005315.5W [OGB] USING COMBINATION OF CORR'D DECCA, HSA AND RADAR. CHAIN SWEPT CLEAR AT 18.4, FOUL AT 19.6MTRS. LEAST E/S DEPTH 18.3 IN GEN DEPTH 37.7MTRS. NO SCOUR. (TH PATRICIA, WK REPORT 7.2.92). AMEND TO SW 18.4MTRS IN 543735.5N, 005315.5W. RETAIN BUOYS. - NM 780/92. **HH242/610/04 15.5.92 WK CONTINUES TO BE MARKED BY 2 BUOYS. RACON TO BE WITHDRAWN FROM N BUOY ON 1.6.92. (TH NM 10/92). SMIT TAK SALVAGE CO CARRYING OUT DIVING SURVEY OF WK. (TH, FAX 6.5.92). DELETE RACON. - NM 1628/92. 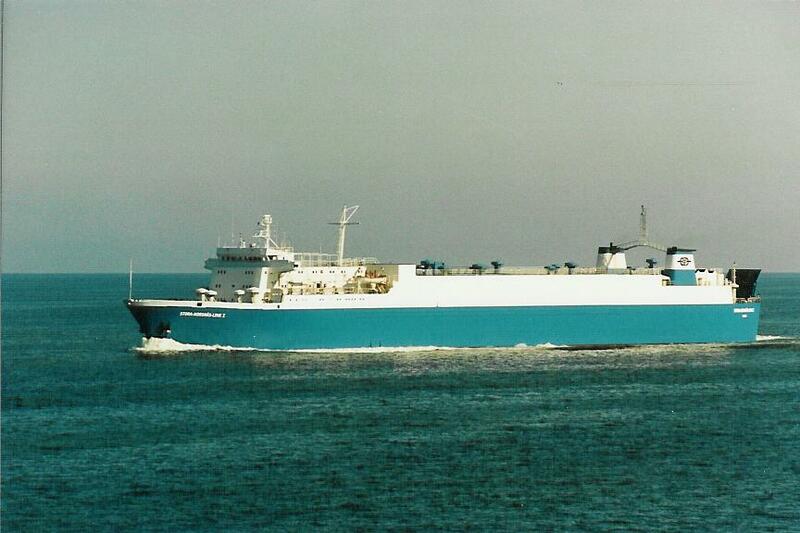 **20.5.92 WK LIES ON ITS SIDE WITH TURN OF THE BILGE KEEL THE HIGHEST POINT. TH REQUIRE OWNERS TO ACHIEVE A CLEARANCE OF 20MTRS [LAT]. (MR NOBLE, MURRAY FENTON MARINE SURVEYORS, TELECON). **HH242/610/04 19.6.92 EXAM'D 7.6.92 IN CHARTED POSN. LEAST E/S DEPTH 17.49MTRS IN GEN DEPTH 37MTRS. SEA STATE MODERATE WITH RISE AND FALL OF ABOUT 1MTR. S CARD. BUOY WITHDRAWN. (THV MERMAID, 8.6.92). AMEND TO WK 17.4MTRS. DELETE BUOY. - NM 1961/92. **HH242/610/05 16.4.93 INITIAL DIVING WORK TO COMMENCE BEFORE DISPERSAL OF WRECK. (TH, FAX 8.4.93). **HH242/610/05 11.6.93 LEAST DEPTH NOW 20MTRS. N CARD BUOY TO BE WITHDRAWN BETWEEN 14 & 18.6.93. (TH, TELEX 9.6.93). - NM 2210/93.